The hour went forward in Ireland this weekend and the change in daytime brought a run of incredibly sunny days with it. Everyday since Sunday we have been treated to temperatures of up to 20 degrees celcius (and sometimes more) and glorious sunshine. I live in County Dublin so while I’m close enough to the city centre to be able to get there within 1 hour’s journey, I’m also beside farmland, and the seaside. In fact if I open my windows on a quiet day I can hear the waves crashing on the shore and/or the cows in the next field over. Yes, that close. With the sunny weather it has heralded the arrival of the ice cream vans. Not just the odd one hoping to get a bit of business on a chilly day (I spotted a van here over the Christmas holidays), but sometimes more than 4 vans in the one day. If we were to buy ice cream from these vans even once a day we’d be broke and at this point I hang my head in shame. This is because this very mean mammy has been known to inform the toddler with much confidence that ice cream vans only make music when they are empty. But there is something about the tinny sound of “O Sole Mio/Just One Cornetto” being piped through the tannoy along with the chug of the diesel engine that powers the vans that makes me feel like I want something cold and sweet straight away. This is a cheat’s semi-freddo. There is very little to be compared to the original Italian recipe but it is easy, quick to make and keeps well in the freezer for about a week. You need very little equipment, can make this purely with shop bought ingredients without the need for a mixer or cooking, and it is relatively cheap. This frozen delight makes a show stopping finale to a BBQ party and you can add any sweet ingredient you like to the mixture. Here I have served it with freshly made, warm lemon curd but it goes equally as nicely with a chocolate sauce or a fruit compote. You could also flavour it with a favourite cream liqueur such as Baileys. Line your freezer proof tub or bowl with cling film. Make sure it is hanging over the edges. Press firmly inside so as to match the shape of the container. In a large bowl whip your cream to soft peaks with the whisk if you haven’t bought a tub pre-whipped. Crumble the meringue into the whipped cream. It doesn’t really matter if it’s large chunks or small. Stir well with the large spoon to make sure every piece of meringue is coated with the cream. At this point you can add any extra flavourings you wish such as cocoa powder, chocolate chips, dried fruit, candied peel, a swirl of salted caramel sauce etc. Using the spoon, scoop up the mixture and fill your lined container. Put all the mixture into the container. Pull the cling film over the mixture so that it’s entirely covered then press gently with your hand to make sure that there are no air bubbles. Place in the freezer for a min of 2 hours to solidify. To serve, simply remove the container from the freezer and tip onto a plate then remove the cling film. Cut into slices or chunks as you wish. Eat straight away. This looks such a handy recipe. 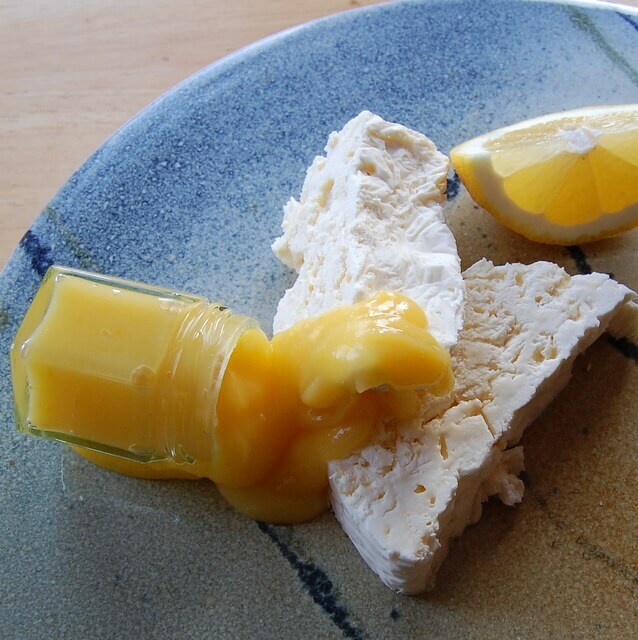 I love the idea of lemon curd with it. It is so easy and so simple I can’t emphasise that enough. Maybe one for the kids to make for a special meal either.